"Some Notes On Outboard Motors"
A 1963 paper by the Chief Engineer of Perkins Outboard Motors Ltd.
An Oliver in Italian Garb! Thanks for stopping by the Museum. The museum needs your help. Email us your Oliver, Chris-Craft or Perkins GIFs or JPEG's of any sort or mail scannable materials to PO Box 763, White Cloud, Michigan 49349 and we will publish it in the appropriate section. Don't forget to include a SASE if you wish to have your mailed submissions returned. Enjoy your tour of the Museum and come again soon. Email comments or submissions to curator@pfs-ware.com. Oliver Outboard Service Manual now available! 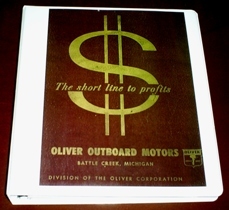 New 3-ring binder bound reproduction of Oliver's last service manual covering all models from the beginning of production in 1955 through the last models produced. Manual is in excess of 330 pages & 330 pictures & illustrations in 9 sections covering General Information, Powerheads, Lower Unit, Ignition, Starter (both electric & manual), Carburetion, Fuel System, Tools, and Miscellaneous. Professionally copied from quality originals. $47.50 postpaid to U.S. addresses. Add $5 (U.S.) for Canadian delivery. New Old Stock parts & motor accessory items now available for Oliver / Chris-Craft / Perkins / Anzani outboard motors. The most complete listing of available parts for these motors since they disappeared from production some 40 (and more) years ago.